Batting: Dinesh Chandimal 44 off 121 balls, Dickwella 31 off 78 balls, Perera 20 off 44 balls. 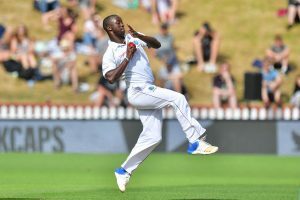 Bowling: Cummins 3/39 in 12.4 overs, Gabriel 2/48 in 13 overs, Kemar Roach 2/34 in 10 overs, Jason Holder 1/15 in 7 overs, D Bishoo 1/25 in 13 overs. Batting: K Powell 64 off 80 balls, Devon Smith 20 off 30 balls. Bowling: Lakmal 1/25 in 8 overs, Kumara 2/28 in 5 overs, Herath 1/22 in 11 overs. The pitch was expected to be pretty difficult to play on as it was going to offer uneven bounce and this would aid the pace bowlers. 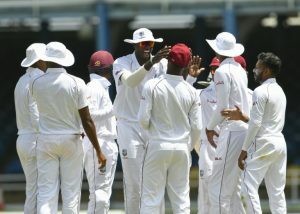 This was good news for the Windies but not for the Sri Lankans who were trailing by 383 runs with only 7 wickets in hand. Windies wishes were soon answered as Roach shattered the leg-stump of Silva and Sri Lanka lost their 4th wicket. Sri Lanka’s wicket-keeper Dickwella joined Chandimal on the crease. The pitch was continued to constantly make problems for the batsmen. But, somehow both these players retaliated the Windies pacers and laid a 78-run partnership to steady Sri Lanka’s sinking ship. At this point, Chandimal was closing in on a well-deserved fifty, but this milestone of his was denied by Gabriel who took his wicket before lunch. Perera joined Chandimal hoping to repair the immense damage done by the Windies pacers. But, Dickwella who was playing quite patiently, but he lost his wicket due to his laziness as he was run-out by Brathwaite. With this wicket, West Indies now had exclusive access to Sri Lanka’s lower order as Herath walked out to bat. 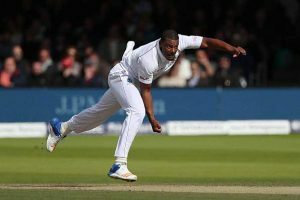 Jason Holder brought Cummins back into the attack and it paid off as he took Herath’s wicket and Sri Lanka lost their 7th wicket of the match. Lakmal was the new batsman after Herath and at this point Sri Lanka 148/7 and they needed to get to 215 runs to avoid a follow-on in this test. But Windies were bowling quite exceptionally as the last recognised batsman fell to David Bishoo who claimed his 1st wicket of the match. After this wicket, Lakmal and the new batsman, Gamage shared a 19-run partnership to hold off Windies pacers for quite some time. But, it was not long before Cummins claimed his 2nd wicket of this innings and Lakmal went back to the pavilion. Kumara was the last man in and he also became a victim of Cummins bowling and Sri Lanka’s innings came to a close. West Indies captain had the option to enforce a follow-on but he chose to bat as Tea was called on the 3rd day of this test. This was a poor decision to make and cricket fans thought the same. Having a lead of 229 runs, West Indies openers Devon Smith and Brathwaite started the 2nd innings for WI. Sri Lankan bowlers were being consistent with their line and length and got rewarded for it as Lakmal took the wicket of Devon Smith. Further pressure was induced on West Indies as Kumara struck in his very 1st over and sent Brathwaite back to the pavilion. Shai Hope joined Powell at the wicket, but after sharing a 20-run stand Hope departed, courtesy of an epic catch by Kusal Mendis. At this point, Roston chase came on the crease and both batsmen shared a 44-run stand to deny Sri Lanka any wicket and break their momentum. And, in this process, Powell reached his fifty; A proud effort. The day was coming to an end and this 44-run stand of WI was broken by Herath who shattered the stumps of Roston Chase. Sri Lanka needed 1 more wicket to end the day on a positive note. But, Shane Dowrich and Powell held on tight and ended Day 3 with West Indies in the lead by 360 runs and 6 wickets in hand. West Indies Vs Sri Lanka 1st test is shaping up to be on West Indies side and Sri Lanka need a miracle to draw this test much less win it. Join Allsportspk tomorrow for Day 4 of West Indies Vs Sri Lanka 1st Test.